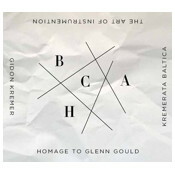 Nonesuch Records released The Art of Instrumentation: Homage to Glenn Gould, by violinist Gidon Kremer and his Kremerata Baltica chamber orchestra, on September 25, 2012, which would have been Gould's 80th birthday. The album comprises 11 pieces and arrangements by contemporary composers that quote from or are inspired by works, mostly by Bach, that Gould famously recorded during his career; two Arnold Schoenberg pieces also are drawn upon in one piece. For more information on this CD visit the Nonesuch website.